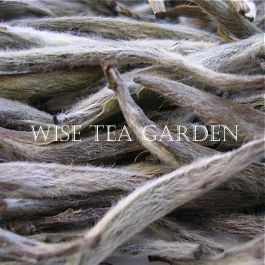 PEONY WHITE NEEDLE © Wise Tea Garden .com White tea belong to the category of light-fermented teas and is mainly produced in the Fujian Province. It is characterized by the high content of succulent, whitish and hairy leaf buds with a slight greenish tinge. 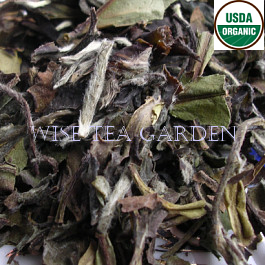 White tea is considered to be the purest in the world. Spring buds are plucked, dried, and sorted with no firing or steaming, and no fermentation. Traditionally, white teas are grown on small freehold plots. 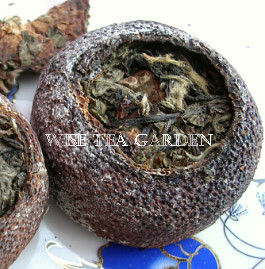 For example, good quality Pai Mu Tan can be in short supply from time to time. It is grown in the mountains near Fu-Ding City (Fujian Province). The tea estates are small, numerous and run as cooperatives benefiting all. Some growers produce only a few hundred pounds of White tea per year. Note that White teas have a very high polyphenol (antioxidant) count and are usually stimulating. Steeping Time: Allow the boiling water to cool for a minute before using. Brew a white tea for 7 to 10 minutes. Do not to consume White Tea during pregnancy or breastfeeding. Shelf life of nitrogen-flushed and vacuum sealed packs: 20-22 years. Packaging: Re-seal zipper pouches with window, or nitrogen-flushed vacuum-sealed bags.  To order by multiples of 50g, please set the 'Quantity' as follows: 1 x 50g, 2 x 50g (100g), 3 x 50g (150g), etc. An extra 6g is always added to each of your favourite tea ordered by multiples of 50g.  Orders of 500g are packed in nitrogen-flushed vacuum-sealed bags - 20-22 years of shelf life.  Non-traceable service can be done on request - no coverage is provided by Canada Post.  Postage is adjusted for traceable services within 2-3 business days if an overcharge for shipping exceeds $1.50. It is believed to be one of the rarest teas in the world - only 600kg of it are made on an annual basis. This tea is made from only the choicest, silken and velvety white tips, flushed by highly specialized tea bushes in the Great Rift Valley's cool early mornings. The fresh leaf is hand plucked, hand rolled and dried naturally. The process is exceedingly laborious and even the most skilled tea artisan can produce only about 1kg per day. Cup Characteristics: Breathtaking flavor with notes of honey, roasted nuts and Madagascar vanilla. Note that Kenyan teas are all natural and almost organic by default: They are grown on estates, which do not use pesticides or herbicides because pests that typically damage tea crops are not found at their high altitudes. Instead, the estates use nitrogen (N) as a natural fertilizer making them almost Organic by default. Ingredients: Luxury Natural White Tea. Infusion: Light with African dawn gold notes. 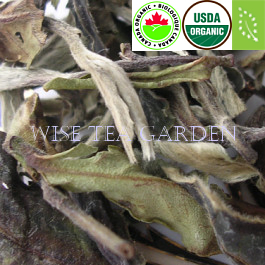 Organic Certificates: USDA, Certified Organic by QMI Organic Inc.
Cup Characteristics: Naturally withered and sundried 1st garde white tea (a.k.a. White Peony). Clear slightly pale cup with a fresh aroma reminiscent of Keemun or a mild Bordeaux and a smooth velvety flavor. This is the highest grade of white tea available. Pai Mu Tan leaves are plucked from a special varietal tea bush called Narcissus or chaicha bushes. Secondly the leaves are not steamed or pan-fired. The leaves are naturally withered and dried in the sun. Ingredients: Luxury Certified Organic White Tea. Infusion: Pale yellow. 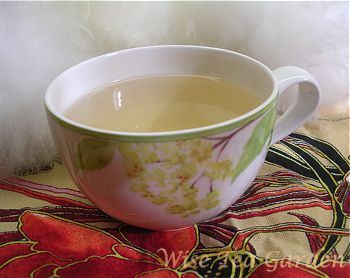 Cup Characteristics: This delicate white tea has a clean taste faintly reminiscent of fresh apples. Refreshing with a lovely lingering flavor. 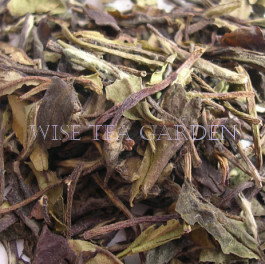 Peony White Needle Tea is the top grade available and very rare hence its high cost. 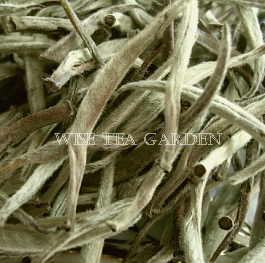 You will see the long white needles covered with furry down and a very uniform appearance - hallmarks of very rare white tea. Rules for picking Peony White Tea: Only picked between March 15 and April 10. Not picked on days that may be raining. Not picked if the dew has not dried or if there is frost on the ground. No purple buds allowed and the stems must not be too long or too short. Leaves damaged by wind, handling, insects or partially open are rejected and put into a lower grade. Ingredients: Luxury White Tea. Infusion: A shimmering clear infusion. Cup Characteristics: A stunning white tea comprised of delicate silver needles and white tea leaves. *Plucked and processes entirely by hand. * It has a delicate and tempered notes of baked almond and a slightly wild finish. One of the world's finest Chinese white teas. Tea trees on such plantations are usually planted by man, and this kind of plantation are called 'semi-wild'. Note that Wild tea is an ancient and extremely rare. Silver Moonlight, in particular, was discovered many, many centuries ago, and there are a few legends in which this tea is mentioned. This tea is delicate as thr light of the Moon. Ingredients: Luxury Certified Organic White Tea. Infusion: Light amber. Cup Characteristics: White Pu-erh produces the outstanding cup with warm notes of vanilla, early spring grass and the subtle character of a lightly roasted mountain oolong. Besides the obvious fact that the tea is packed in an orange, the care of craftsmanship used to get it in there cannot be underestimated. From the careful plucking of centuries old tea bushes, to the rolling on wide wicker baskets to the natural wood fires used to flash heat the mandarin orange peel, everything is done entirely by hand. Rare tea. Ingredients: Luxury White Pu-erh Tea. Infusion: A light yellow liquor resembling camomile tea with gentle astringent assertiveness, sweet notes of citrus, honey and vanilla, and a clean finish. There is a believe that it this tea lowers the blood pressure. * Before brewing, please remove tea from its mandarin shell. Cup Characteristics: Smooth, jammy, sweet and velvety Pai Mu Tan highlighted by hints of grape and icewine. Also, makes a fantastic iced tea. Ingredients: White tea, Ontario icewine, Natural flavours (Organic compliant). Infusion: Pale yellow.